Religious liberty is enshrined in the First Amendment to the U.S. Constitution and is a founding American principle. It created a unique society that prohibits a government-established religion, while also sanctioning rights for religious people. It ensures that a diverse range of beliefs can be expressed and have a home in America without interference from the government, enabling people of all faiths and none to live together, learn from each other, and be treated equally. Yet in recent years, religious liberty has often been exploited to fuel hate rather than maintain respect and freedom for everyone. In order to protect this fundamental right, Americans must exercise constant vigilance, and recent threats to the United States’ minority religions are cause for alarm. As one of the first actions of his administration, for example, President Donald Trump instituted a “total and complete shutdown of Muslims entering the United States.” Subsequently, rather than providing checks and balances to this attack on religious freedom, the U.S. Supreme Court upheld the Muslim ban, ruling that the United States may deny travel and entry from individuals who come from certain predominantly Muslim countries. The Supreme Court should be supporting policies that foster—rather than chip away at—the essential American right to religious liberty. In addition, groups of religious minorities face rising threats in the form of hate speech, discrimination, and violent attacks. 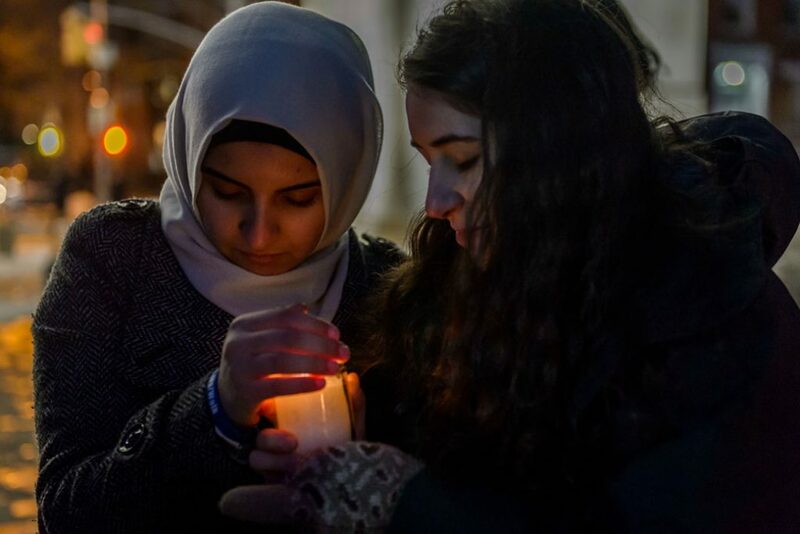 Analysis of FBI hate crime data from 2017 reveals that almost 80 percent of all incidents of religiously motivated hate crimes were motivated by anti-Jewish and anti-Muslim bias. The most fatal attack on American Jews took place in October 2018, with the tragic shooting at Tree of Life synagogue in Pittsburgh. The attack was reminiscent of a hate crime that occurred in 2012, in which a gunman with ties to white supremacist organizations killed six people and wounded three others praying at the Sikh Temple of Wisconsin. These tragic incidents demonstrate the very real threats from which people of all faith backgrounds should be protected. These efforts have laid the groundwork for redefining the extent of religious liberty protections. For example, the U.S. Department of Health and Human Services (HHS) recently announced that South Carolina’s faith-based foster agencies—even those that receive federal funding—are not required to comply with federal rules barring religious discrimination. This decision came after a Christian child welfare agency denied a qualified Jewish woman the opportunity to serve as a foster mentor because of her faith. This weaponization of religious liberty has deprived children of welcoming homes and denied eligible LGBTQ and non-Christian prospective parents the opportunity to adopt or foster. It has favored a certain set of religious beliefs over others, allowing a majority religious group to discriminate against religious minorities. It also threatens LGBTQ rights and creates a false narrative that civil nondiscrimination and the protection of religious beliefs are mutually exclusive. This is one of many discriminatory efforts spearheaded by the HHS Office for Civil Rights (OCR), which recently established a Conscience and Religious Freedom Division to codify the favoring of religious liberty over all other rights. The office’s director, Roger Severino, has stated that the division will allow health care workers and institutions to deny patients access to health care if they claim that the provision of such care is in conflict with their religious beliefs. The OCR also further weaponized religious liberty by issuing two final rules in November 2018 that provide employers with religious and moral exemptions from offering contraceptive coverage to their employees, directly contradicting coverage requirements under the Affordable Care Act. These rules cover “sincerely held religious beliefs” and “non-religious moral convictions.” The Trump administration moved forward with finalizing the rules, even though two federal district courts enjoined the interim final rules. Fortunately, on January 14, 2019, a federal judge in Pennsylvania also blocked the final rules, citing that current law does not allow for this carveout of contraceptive coverage. Religious liberty protections were never intended to justify the discrimination of individuals in health care, child welfare, schools, the workplace, or any aspect of public life. In our current moment, religious liberty is too often used as an excuse to justify hateful attacks on vulnerable communities. Policymakers should uplift this fundamental right for what it was originally intended to be: a shield to protect religious institutions and allow for the freedom of all beliefs to flourish in the United States—not a sword to cause harm to others. This fundamental and unique American value deserves to be cherished and must be protected from hateful and dangerous manipulation from all levels of government. Emily London is a research assistant for the Faith and Progressive Policy Initiative at the Center for American Progress. Maggie Siddiqi is the director for the Faith and Progressive Policy Initiative at the Center. The authors would like to thank Osub Ahmed and Frank Bewkes for their thoughtful input regarding this column.